NGC457, the so-called Owl Cluster in Cassiopeia, is a well-known target for visual observers and is an easy target for astrophotography. I integrated 383 exposures, each of 10 seconds duration, to achieve the final result. The data was acquired on November 15, 2014. I used Pixinsight for all processing. The second image is a far more challenging venture. The primary object is NGC3718, a distorted spiral galaxy also known as Arp 214. 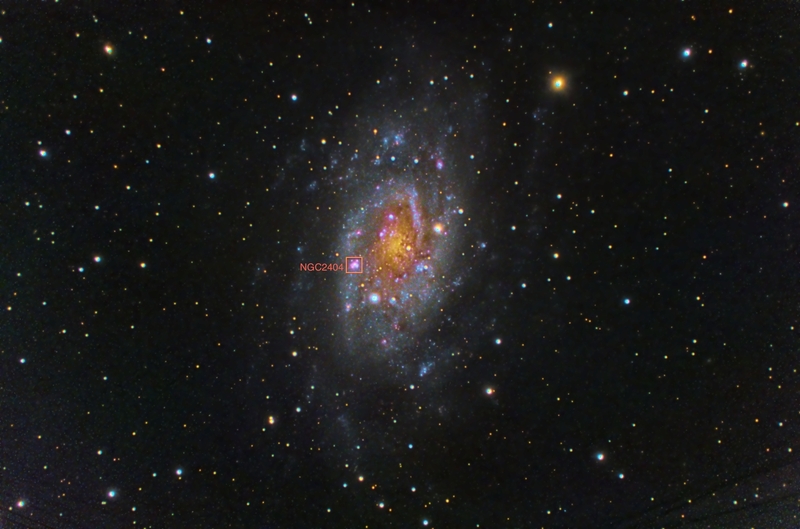 Very likely the gravitational disruption of NGC3718 is due to the companion galaxy NGC3729 (seen at the bottom of my image), which is located a mere 150 thousand lights years from NGC3718. The two galaxies are about 52 million light years from Earth. To the right of NGC3718 is Hickson 56, a cluster of five interacting galaxies that are about 400 million light years from Earth. My image is the result of integrating 1244 exposures, each of 10 seconds duration, taken over four nights in April, 2015. It took a great deal of effort to acquire and process this many exposures, and yet the result is not as revealing as I had hoped. I was unable to capture the faint, swirling extensions of the spiral arms in NGC3718 that is seen in other images, although a faint hint can be seen in my image in the direction of the Hickson group. I think this result highlights the limitations of my setup. Since I have restricted my exposures to 10 seconds to minimize the consequences of poor tracking (for astrophotography) and field rotation, the result is subject to more camera read noise as well as noise from the sky background. Perhaps adding more data would improve the result, but a tracking system that allows for longer subs is clearly needed for such a challenging object. I processed the image three different times, trying different approaches in each, but was unable to improve upon the result posted here. I have finished an image of NGC2403, a fine galaxy in Camelopardalis, and have posted it in my gallery. This galaxy is a member of the M81 group and is approximately 8 million light-years distant. There is a bright emission nebula and open cluster within the galaxy that has its own NGC number, NGC2404. I reproduce my image here with the location of NGC2404 indicated. This image is my most ambitious effort yet with my Obsession dobsonian. It is composed of 1221 subs, each of 10s duration, for a total of 203.5 minutes of total exposure. The images were captured on February 14, 15 and 16, 2015 at Zephyr Ridge Observatory. I used Pixinsight software for processing.